The High-Fidelity™ Interface System with patented and patents-pending technology is a socket platform for both upper and lower limb amputees of all activity levels and ages and is backed by clinical evidence. The HiFi is not a fad or gimmick but is proven socket technology allowing patients to have unmatched clinical results: increased stability, less falls, greater comfort, increased functional ease, greater walking capacity, longer wear times, faster walking speeds, improved gait symmetry, less energy exerted, reduced pistoning, increased proprioception, greater range of motion and freedom of movement and much more. 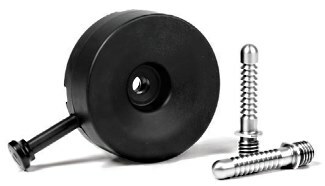 Remember the HiFi can be used with any suspension technique, is adjustable, and is subischial in the TF application. Improve your outcomes and reimbursement. Sign-up for an upcoming HiFi webinar. ALPS' new Flex Sleeve (SFX) has a seamless knitted construction. It features ALPS HD Gel, which has a relatively firm nature and provides maximum comfort while providing a great degree of control. The SFX has a 30° preflexion to allow for ease of bending and to reduce bunching behind the knee. Our rapid rivets are brass/nickel plated and will not rust. Packed 1,000 caps and posts per bag. Our new residual limb casting socks are specially designed to easily roll on for quick and clean residual limb application with no guesswork about how tightly or loosely to apply casting tape. They virtually eliminate all wrinkling and roping, and provide excellent conformity for transtibial and transfemoral residual limbs. The result is a glass-smooth finish of uniform thickness, producing a superior model perfect for scanning. The product comes in four sizes. Save time, see more patients, and make a great impression. Spinal Technology is the exclusive manufacturer of the Providence Scoliosis System, a nocturnal bracing system designed to prevent the progression of scoliosis, and the patented FlexFoam™ spinal orthosis. Call, visit our website, or email us at info@spinaltech.com for more information. Having a component inventory available in your facility does not make our product OTS. A VertAlign Spinal Support System is custom fit, requiring the clinical and biomechanical expertise of an orthotist to select the correct front and back shells from the 550 different size, shape, lordosis- and kyphosis-possible configurations. The orthotist's professional skills are needed to select, adjust, and apply the components that meet the patient's unique anatomical and spinal support needs. We provide components and product training. You provide clinical judgement and professional skills. Surestep provides a full range of custom-fit products for your pediatric patients. With uniquely flexible, proprietary plastic, you'll receive orthoses designed for both stability and comfort. 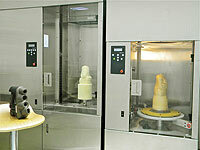 A two-day turnaround time is offered for products by measurement, four days by cast. And for even more customized solutions, Surestep features a complete central fabrication department. Surestep Central Fabrication provides everything you need: quick turnarounds, customization to measurements, and competitive pricing. Lean on our years of experience and solid reputation for quality. Utilizing Surestep Central Fabrication allows O&P professionals like you to easily manage costs, time, and profitability. The RUSH Foot Collection is like nothing else on the market today. Carbon fiber has been the standard in prosthetic feet for decades, but carbon fiber is not optimal due to limited flexibility and composite failures. The RUSH Foot's unique, tried-and-true glass composite was originally developed for aerospace applications and reimagined by Ability Dynamics to eliminate traditional weak points in prosthetic feet. The RUSH Foot's superior engineering delivers the most realistic and responsive foot and ankle motion available today. It is exponentially more flexible than carbon fiber and stress points won't fail when subjected to pressure, water, or impact. Amputees report an unmatched range of motion from the roll-through design, allowing for a super smooth transition from heel strike through toe-off with no dead spots in between. The RUSH Foot helps maintain a natural, smooth gait even in the most extreme terrain. One foot for all your adventures. Comfortable. Flexible. Durable. Virtually indestructible. Carbon feet don't stand a chance. Learn more about which RUSH Foot is right for you by visiting www.rushfoot.com. Friddle's Orthopedic Central Fabrication offers same-day turnaround on most test sockets. We have a variety of brim styles to choose from, and custom brims are available upon request. Our CAD/CAM expertise provides practitioners with an optimal shape and design. Having the model in our software allows for easy adjustments when going to a laminated socket. Our pricing is competitive and our service unparalleled. We look forward to serving you with your prosthetic socket needs. American Association of Breast Care Professionals, a national organization founded in 2004, is dedicated to the representation of post-mastectomy care professionals. Developing post-mastectomy standards of care and education, AABCP provides all levels of educational opportunities: basic fitter certification, business, regulatory boot camp, and the annual Global Breast Care Summit & Expo. Believing that trained, certified providers provide optimal care, AABCP maintains a public advocacy and awareness campaign through social media. AABCP strives for a sense of community between stakeholders, insurers, politicians, organizations, and professionals fostering academic partnerships, supporting statistical surveys outcomes research, to better serve breast cancer survivors. O&P RESOURCES: Apis Footwear Co. The Mt. Emey custom shoe program offers the best bang for the buck. We guarantee the fit—if they don't fit, you don't pay. Choose any style from our catalog and pay one flat price. Any modification within the order is included at no additional charge (e.g., steel shank, heel lift, wedge, or flare). One pair of custom-molded insoles are included with each pair of shoes or boots. Celebrating 40 years of service to orthotic professionals. Amfit Contact Digitizer, Impress Scanner, and CAD/CAM Mill set the standard for 3D foot orthotic casting, design, fabrication, and services. How can we serve you? Call or email sales@amfit.com. SPIO is proud to introduce Core-Max, a family of lightweight and versatile pediatric TLSOs that incorporates all the benefits of a traditional SPIO orthotic, with rigid panels or stays. Mention this ad and receive free shipping on your next order. Motion Control, a Fillauer Company, is now distributing the former Hosmer E2 Electric Elbow. Renamed the Motion E2 Elbow, it is available in four colors and two sizes (large and medium). The Motion E2 Elbow is a lightweight electric elbow that can be used with simple switch control or proportional myoelectric control. It is small enough to be used by adolescents or small adults. Forearms can either be prefabricated or custom fabricated from Fillauer Central Fabrication. For more information, contact Motion Control at 801.326.3434 or www.motioninfo@fillauer.com. NSP/CSP is a green, eco-friendly, natural fiber that creates no itch. NSP/CSP is a unique natural fiber that is lighter and stronger, and offers half the stiffness and ten times the impact resistance of carbon. The stiffness can be regulated by fiber orientation to equal carbon. NSP/CSP is dynamic it its ability to either be stiff or flexible depending upon the practitioner's preference. NSP/CSP wets out fast because of its high resin fiber interface and low void content, which means the resin sticks and air does not get trapped easily. It's excellent for elevated vacuum. The human body is dynamic, yet conventional prosthetic sockets are static and rigid. to the body, and fits like an athletic sandal versus a wooden shoe. Wearing a prosthesis is now breathable, adjustable, and as comfortable as your favorite pair of sneakers. Greatly increase your clinical practice efficiency. Most fittings require just one appointment—microadjust, Loctite, and deliver. View the free ICON BK training at www. socket-soft.com. The Pro-Fit 1000 will quickly become your go-to tool for grinding, milling, and finishing. It combines solid construction with quiet performance and helpful adjustments to tackle virtually any job that comes through your workshop. With almost 16 inches of height adjustment, it delivers the precise and variable speed control critical for your patients' care. To learn more, visit www.professionals.ottobockus.com or talk with your local sales representative. The ultracomfortable ICON™ BK socket technology more comfortably conforms to the body, and fits like an athletic sandal versus a wooden shoe. Wearing a prosthesis is now breathable, adjustable, and as comfortable as your favorite pair of sneakers. View the free ICON BK training at www.socket-soft.com.